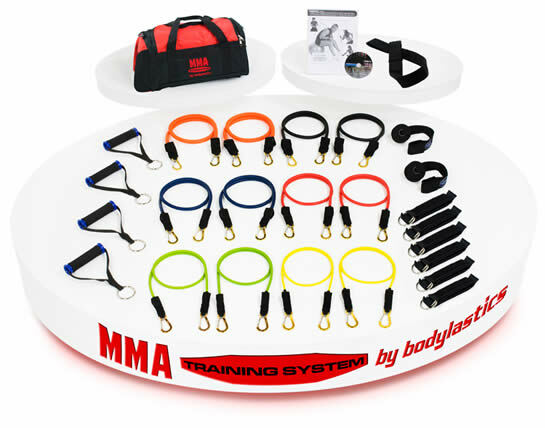 If your looking for an edge in Mixed Martial then train with these amazing MMA resistance bands from Bodylastics. Develop your speed, strength and power by training with these heavy duty MMA bands built with Anti-snap technology to stop overstretching the bands. Get stronger faster with the toughest resistance bands on the market. Increase kicking and punching power. Improve muscle endurance and muscle flexibility. Get more from your training with these cutting edge resistance bands. This entry was posted	on Tuesday, June 11th, 2013 at 11:19	and is filed under Resistance Bands. You can follow any responses to this entry through the RSS 2.0 feed. Responses are currently closed, but you can trackback from your own site.